Full Page Slides: A full-page copy of one slide per sheet. Notes Pages: One slide per page, but with the slide occupying only the top half of the page. The bottom half is devoted to any speaker notes you typed into PowerPoint. Outline View: A text-only version of the presentation, structured as an outline, with the slide titles as the top-level outline items. Handouts: Multiple slides per page (two to nine, depending on your choice of settings), suitable for giving to the audience to take home. Different numbers of slides per page have different layouts. For example, if you choose three slides per page, the layout has lines next to each slide so the audience can take notes. Click the File tab, and click Print. Choose a different printer if needed from the Printer drop-down list. Click Full Page Slides to open a menu. From the Print page in Backstage view, set print options for the handouts. Click one of the layouts in the Handouts section of the menu. Adjust any other print settings as needed. Click Print to print the handouts. Click Print to submit the print job to your printer. 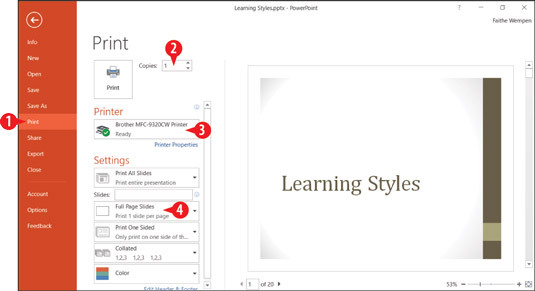 When you print handouts from PowerPoint, the Handout Master’s settings determine the details of how the handouts appear. You may want to customize the Handout Master before you print. 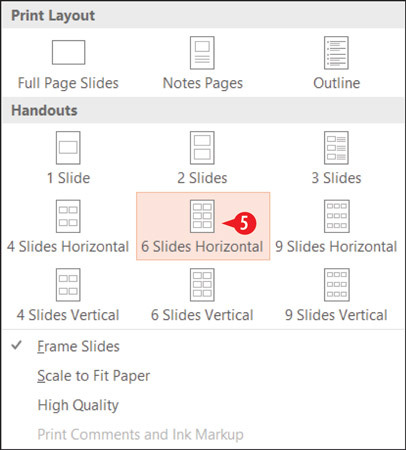 The Handout Master settings apply only when you’re printing the Handouts layouts, not when printing full-page slides, notes pages, or outline view. On the View tab, click Handout Master. If you see a message about edits being lost when saved to the server, click Check Out. 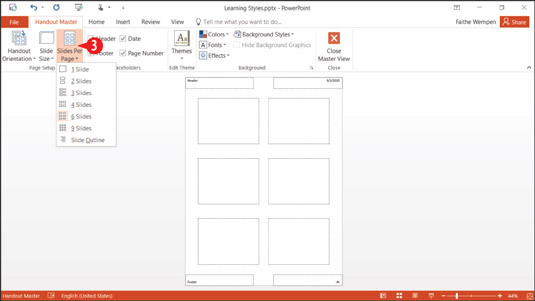 Open the Slides Per Page drop-down list and select the layout you want to modify. Choose which handout master layout to modify. To change the orientation, click Handout Orientation and then click Portrait or Landscape. To change the slide size, click Slide Size and then click Standard or Widescreen. To remove any of the placeholders (in the four corners of the page), clear its check box on the Handout Master tab. To change the theme, select a different one from the Themes button’s menu. To change the Colors, Fonts, or Effects, make a selection from those buttons’ menus. 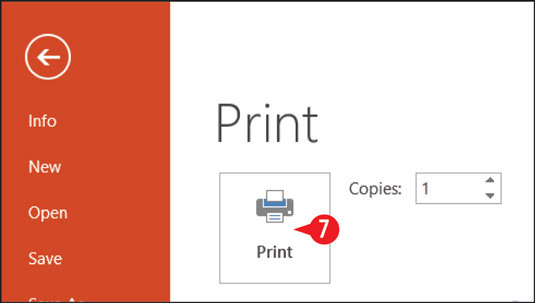 To add a background color to the handout, select one from the Background Styles buttons menu. Click Repeat steps 3-9 to modify other layouts if desired. Using a background style for something designed to be printer, like a handout, will use a lot of printer ink, which can be expensive.